WordPress Website, Inc That - NOYO Web Development Inc.
As a lawyer, it can be a challenge to start a new business venture from just an idea. Working with NOYO Web Development Inc. was hands down the best experience I have had with a web developer. Their process to accomplish your goals is flawless. INCthat.com is an online search engine and legal software that was created by California corporate gurus obsessed with making the process of starting a business in California simpler, faster, more automated and less expensive to make it easy for anyone to start their dream business. 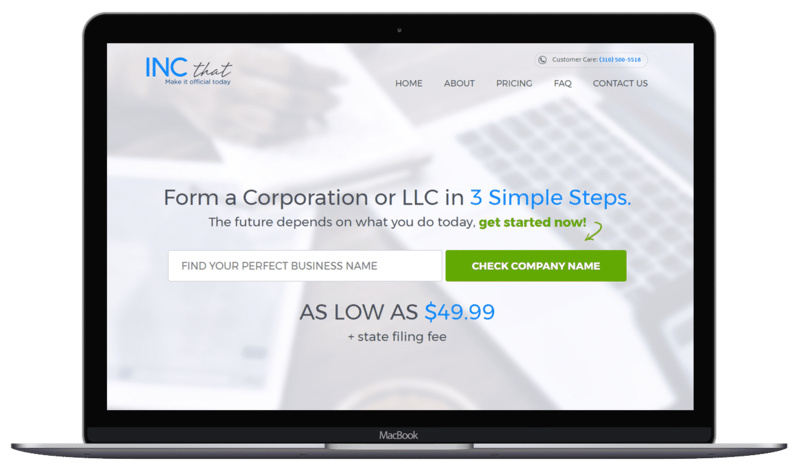 Unlike other entity formation websites, INCthat.com is an automated search engine for searching the names of registered California corporations and LLCs, as well as an online automated entity formation and filing service. Searches made on INCthat.com comb through the currently posted Secretary of State business search query of existing corporations and LLCs registered in California. Our automated service can give you an indication of whether the name is currently in use by another company.